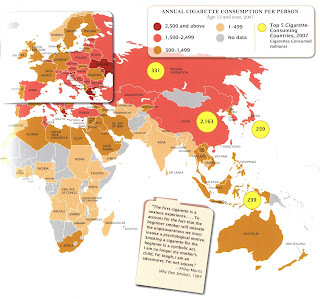 The World Health Organization will celebrate World No Tobacco Day on May 31. The day was created to raise awareness to the dangers of smoking and start a discussion of what can be done to prevent tobacco-related deaths around the world. This year, more than five million people worldwide will die from tobacco-related conditions, and according to the American Lung Association, 448,000 people die from tobacco-related diseases in the United States. The maps above (click to enlarge) are from The Tobacco Atlas, available from the Atlas Collection in Ball State University Libraries. The atlas, now in its third edition, is completely updated and revised in 2009. 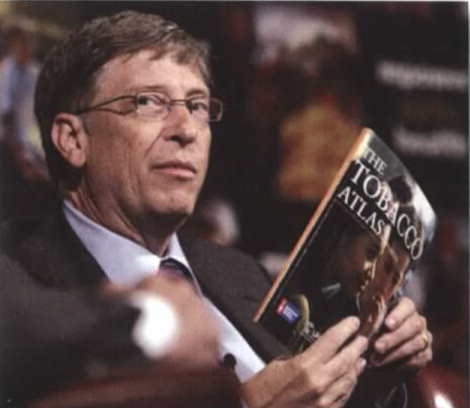 The atlas was published by the American Cancer Society and the World Lung Foundation. The atlas shows the prevalence of tobacco, reviews health risks, charts the costs of tobacco, and describes the tobacco industry in nations around the world. 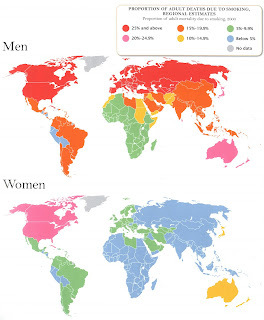 The third map displays the percent of males who smoke cigarettes in the eastern hemisphere. A chart shows the top twenty male smoking populations. Note that the number of male smokers in China alone compares to the total population of the United States. This atlas is available for research projects and papers, and the maps can be scanned for visual aids. The atlas circulates for 28 days or longer. For more information about this or any other topical atlases from the Atlas Collection, please contact the staff of the GIS Research and Map Collection at 765-285-1097.